Physicians and staff from Englewood Hospital and the Englewood Department of Health during the designation of the hospital as a stigma-free zone. 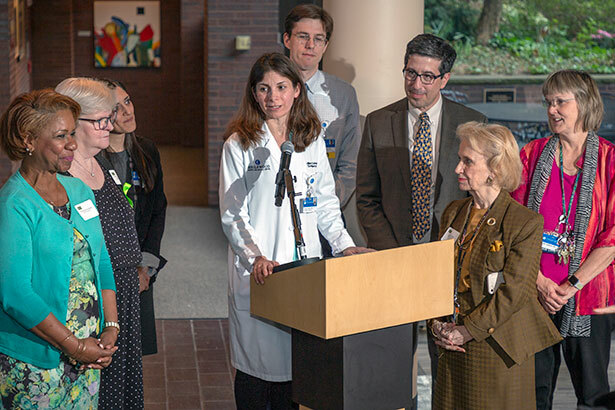 Pictured from left to right, Phyllis Brown-Edwards, Deborah Baldwin (Englewood Department of Health), Lauren Menkes, Dr. Hillary Cohen, Dr. Stephen Bischoff, Dr. Steven Samuels, Jo-Ann Venezia, and Linda Leighton. May 7, 2018 – Englewood Hospital has been designated a stigma-free zone after demonstrating a dedicated effort to educating the community and offering resources to help combat discrimination and negative perceptions toward individuals with mental illness. Englewood Hospital hopes to raise awareness of mental illness, provide an effective way to reduce stigma against those who suffer from it, and encourage individuals with mental illness to seek services and feel supported. The designation of stigma-free will raise awareness of Englewood Hospital’s mental health resources, so no patient or community member need feel hopeless or alone. The elimination of stigma will enable people to ask for help when they need it, so they can start on the road to recovery, have hope for their future, and be spared avoidable tragedy. The resolution was made during the City of Englewood’s third annual town hall meeting organized by the Englewood Municipal Alliance and Stigma-Free Task Force, on Tuesday, May 1 at Englewood Hospital.